We are a leading Supplier & Manufacturer of Lac & Wooden Coaster such as Wooden Coaster Box, Lac Tea Coasters, Lac Tea Coaster, Wooden Coasters and Wooden Coaster from India. We had a vast experience in this handicraft field. 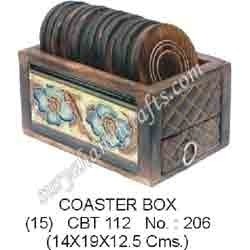 Presently, we are manufacturing and exporting the Wooden Coaster Box. These are designed effectively and are adorned with necessary enhancements by our experienced team. This is widely used as decorative item at residences and it enhances the glory of its surroundings. Depending on the client requirements these are available in several sizes and shapes. This is available in the market at client affordable price.